Being around children gives you license. To wave to strangers travelling on trams. To stare at the blokes who are resurfacing the road. To do colouring-in with waxy crayons. To ride on the little train that operates at the shopping mall during school holidays. 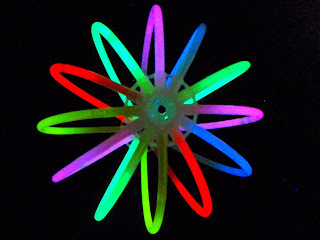 And to muck around with glow sticks. 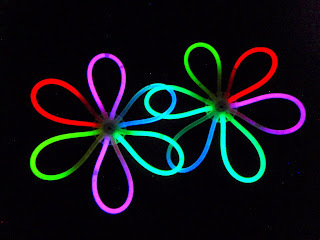 Tip: keep glow sticks in the freezer (this slows the reaction between the hydrogen peroxide and phenol, extending their life) so you can get a proper turn after the kids have gone to bed. Yes, fun fun fun, atleast your children's waving is considered too zealous by a plain clothes federal policeman & mummy gets pulled over. YES, REALLY!! No fine or anything, seriously, get a life Mr Fed, they had seat belts on, i was driving straight, country road home!! Wow those are SO cool! I would have never thought to do that with them! Ohhhh I Love the little trains....toot toot! And Posie...WHAT army grade cyloome sticks...get out..where can I get my hands on those?! I just happen to have a big bag of sticks that we bought in Perth Last year which are right now about to go into the freezer...thx for the reminder! and have you palyed with dollhouse when they aren't around??? I agree!! Now I get to visit Santa, go to water parks, and color to my hearts content. My kids let me re-live my childhood all the time -- thanks for reminding me. I love being able to point at trams and diggers and puppy dogs, while naming them very loudly (with exclamation marks! after! each!). It's all about the kids... till they go to bed, then it's all about you!